Red Comet Unveils Brand New High School Courses in Social Studies. 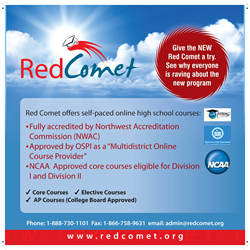 Red Comet, an Accredited, Self-Paced, Online High School, Launches New Enrichment Courses in Social Studies. Red Comet has unveiled several new courses in the subject area of Social Studies. For the 2014-15 school year, students may enroll in new enrichment courses, including Economics with Financial Literacy, History of the Holocaust, and Comprehensive US and World History. These courses allow students to advance their knowledge in this subject area by delving deeper into some key national and world events that have shaped history.